A couple of months ago I was contacted by a local resident of my village with regard to a triple expansion engine built in the nearby town of Beccles in Suffolk (UK) at the turn of the 20th century - 1903 to be precise. 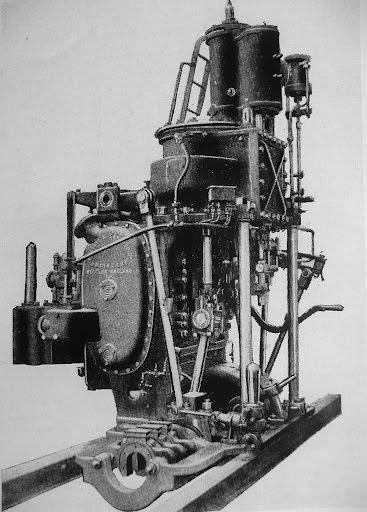 The firm was called Elliot and Garroods and they produced this engine which they termed 'Special Triple Expansion'. 'Monkey' was a local colloquialism. So far we have managed to find four differing photographs of this engine and the overall dimensions but little else. We are aware of the Sovereign model engine sold by Reeves which has a similar layout but the 'Monkey' is rather unique in that the flywheel is between the cylinder centre lines and apparently acts as the intemediate crank web. If anyone knows of any reference to this type of engine we would be very pleased to hear from them. I am quite interested in this conundrum! Roughly what size of engine is it? Is it an engine in situ - or a model that you are referring to? What is the flywheel diameter, approx.? Curious also about the Stephenson link which suggests it is a reversing engine so I am wondering what was its duty? Possibly winding, or rolling? It is certainly an unusual design. You say the HP is above the IP but are they in line (parallel)? Could you possilby scan and upload any of the photographs you have? This engine was developed by E and G to power small fishing vessels. The idea was evidently to shorten the length of the engine in order to increase the fish hold length. Apparently it was very successful and was fitted to many vessels though whether that extended to beyond the fishing industry we are not sure. The person who contacted me, now in his seventies, served his time with E and Gs but obviously well after these were produced. It is our intention if sufficient information can be gained that, with local interest in mind, a model will be made - though Phil is considering making something larger to power his small steam boat. It is hoped that shortly we can meet someone who, now 96!, remembers working on them. 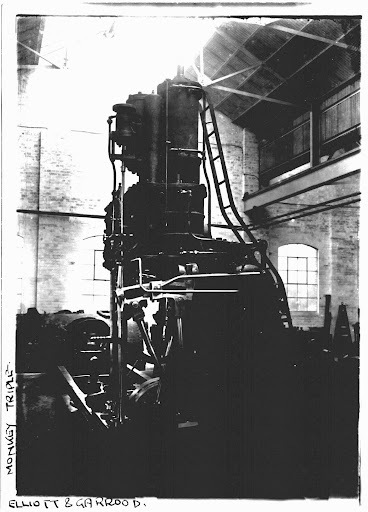 So far we have collated four different images and the overall dimensions - they were made in three sizes apparently but the catalogue image we have only gives two the larger being 9 3/4 x 15 x 22 witha 16" stroke, however RH Clark in his book Steam Engines of Suffolk gives the largest as 9 1/4 X 15 x 26 by 16" stroke. What makes this engine unusal is that the cranks are set at 180 degrees with the flywheel set between and evidentally acting as the central web - this at the moment is a big grey area as none of the images give any indication as to how the crankshaft was supported in the bedplate - incidentally the flywheel diameter is one of the few known dimensions we have - 2'6" - but the width is unknown. Phil is currently producing a set of basic layout drawings from which we hope to flesh out the design but at the moment we do not wish to compromise anything with our own ideas until we have exhausted all possiblities of available material. And this view - too dark to decipher much I'm afraid is in the workshop itself and is I think the very same engine from the front end. I have put this on here rather than by PM just in case it rings any bells with anyone else. If you or others are interested in our progress as it develops we will be only too happy to share it. Looks like it will be a lot of fun for the pattern maker and moulder, with that built in condenser and the trunking from the LP exhaust to core out. I have wondered about using a radial gear like Joy or Walschaerts on a marine steam engine to reduce the overall length, at the expense of course of putting the valve chests on the side. With the engine shown they have more than halved the length of the engine compared to a normal triple expansion, plus there is no awkward to reach valve sandwiched in between the cylinders. On the minus side, the 180 crank could be a pain for manouevering, such an engine will mostly reverse when you throw the links over, but the time it sticks on dead centre will be when you are about to hit something. Yes that's more or less our thinking but having drawn it out unless the flywheel is much wider relative to diameter compared to what it appears - something we can't ascertain as yet - it makes the crank pins set in the flywheel rather longer than you would expect but the wider it is the more weight upon those bearings. We are hoping before too long to begin on a wooden mock up - in the hope that we can see the problems more clearly in 3D.. I suspect the flywheel is probably wider than what we are assuming at the moment - i.e.10". Because of the 180 cranks the engines evidently had to be barred frequently - the barring mech is that short lever sticking out at 45 degrees. Phil is in contact with people who can remember them but not any specific details - indeed he remembers one standing in the corner of the same shop in that second image when he began his apprenticeship - it went for scrap! As he says if only he had been aware that sixty years ahead he would have wished he'd paid more attention! castings are just getting far too expensive ! Hi Ramon, I don't know anything about these types of engines, but just a thought, if it has a wider flywheel than you might expect, could it be possible that it is hollow to keep the weight.down. Well, the flywheel itself need not be the full width, so long as the bosses for the cranks have plenty of meat in them. It is a while since I have seen the insides of a 650 Triumph motor, as I recall they had the two cranks bolted onto the flywheel. Those were a 360 setup, but the same sort of thing should work for a 180. So the flywheel need not be the full width between the two big end bearings, so long as you build in the strength. The usual thing with a compound is that each cylinder should be producing equal power. That would imply that the load on one big end bearing is twice that of the other. On the other hand, the inertia loads might be similar, since the one big piston might weigh as much as the other two put together. What is the betting that somewhere in the undergrowth one of these is lying around somewhere, waiting to show up just after you have finished a model one? There will be some pretty heroic fabrication work to do too! I rather like the triple expansion engine shown in the Bill Durham steam launch book. It was meant for river work in India in a shallow river, so they put it crossways across the boat, and gave it three shafts, each with its own propellor. The shafts were all linked in the engine with coupling rods. The three cylinders would be at 120 degrees, and the coupling rods would be at 90 degrees. There was a separate Stephensons link for each valve. So there would be lots of bits to watch going around. Ramon. Reviving an old post of yours. I'd be interested if you found out anything more on this? These engines were made by my great grandfather. Having just finished a 1/6 scale capstan, I am looking for a new project but know nothing more about these engines than this thread. Hello Ian, this is a surprise! I'm afraid very little more was found out after the last posting. My friend Phil did find another old photo that 'sort' of gave an indication to the valve operating arm but we never did establish the correct layout of the bottom end. That said Phil did an awful lot of work in producing a concept drawing on AutoCad but he suffered computer issues that put paid to that. Sadly Phil died last year with that not quite finished. I think I have copies his files somewhere and what photos, etc he found. If you PM me I will see what I can do for you. You are welcome to what I have as I think without Phil's enthusiasm I'm unlikely to pursue it any further. I try never to make assumptions but I guess your great grandfather would be one half of the company? Incidentally, if you don't reside in the area, the building in that image still stands, the ornate windows still in situ. Very interesting to hear you made the capstan.